Back in 1999, Bullfrog released the sequel to their highly acclaimed God sim, Dungeon Keeper. 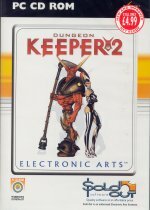 Similar to the original, Dungeon Keeper 2 (DK2) is set in a dark and evil underground world. Remember all those games where you get to play a hero, questing deep into dark dungeons to destroy the forces of evil? Well, this time you are the forces of evil. DK2 is a real-time strategy game where the aim is to build a subterranean lair, fill it with all sorts of wicked creatures and traps, and then defend it against the goodly heroes who wish to see you destroyed. It is a lot of different things, but the biggest feature of this game is the Evil Humor of every aspect of the game. While it is similar to the original game in many respects, there are a number of great improvements which make this game stand out. For starters, instead of a pixellated isometric overview of your dungeon, you are now presented with a polished 3D world. Each room in your dungeon is created with incredible detail, from rats and sculls in the Prison, to books and scrolls fluttering around in the Library. The best part about the overall graphics system is that it has been designed to avoid the dungeon seeming dark and colourless – brilliant lighting and shadowing effects make each room seem more alive and realistic. As well as the graphics, the sound of the game is fantastic. Each room has it’s own ambient noise, and melds seamlessly into the background sound and music as your camera passes by. The music is phenomenal. Staying at a slow and quiet pitch for most of the game, it changes to a rousing, fast-paced track whenever battles are being fought. This gives the game a great feeling of urgency whenever your minions draw their swords. The creatures themselves (your evil minions) are the stars of the game. Each of them looks different in their own way. The weak and stupid looking goblins, the frightening (and fearless) skeletons through to the nefarious vampires. And each creature has their own sounds, habits, likes and dislikes. Each of them will favor a certain fighting style, and will only enter your dungeon if their favorite room has been constructed. The gameplay is quite simple. You start with a dungeon heart – the source of your terrible power. It holds your mana, and serves as, well, the heart of your dungeon. If it is destroyed, you lose the game and are “banished from this world forever”. Or at least until you start the next game. From this starting point, you can send your imps (servant creatures born from magic), out to dig tunnels and mine gold. Once room-sized areas have been dug out, and providing you have enough money, you can place down different types of rooms. Some rooms are necessary, like a Lair (where creatures sleep) or a Hatchery (where creatures eat), while others are added as needed. The Library, for exaple, attracts Warlocks and other “thinking” creatures to your lair, while functioning as a research base where they can discover new spells for you to cast. Once you have captured a portal, and have a few different rooms to attract creatures, they will start making their way into your dungeon. Once there, they’ll create themselves a bed in the lair and head off to do whatever it is they’re required to do. And if you want them to do something else, say if a Warlock was researching and you wanted him to build his skills in the Training Room instead, then it’s simply a matter of picking up the creature in question and dropping them where you really want them to be. While your fighters are training, your thinkers researching and your imps scrabbling to reinfoce your walls and make your dungeons as safe as possible, you can utilize your builders (such as the Troll and Bile Demon) to build a feindish array of doors and traps. Doors range from a humble wooden door, through to a magic door capable of shooting fireballs at encroaching heroes. There’s even a door which looks like a section of rock wall – the Secret Door. On the trap side of things, there’s plenty of choices, whether that be to instill fear in your enemies, alert your creatures to an enemy incursion or to simply destroy the enemy creatures with fireballs, lightning bolts and so on. Once all of your creatures are ready, you can make an attack on your enemy. There are a few ways of doing this. Picking up your creatures and dropping them near the enemy is pretty much the same as Dungeon Keeper 1, but to make it a touch more challenging, you now have to keep in mind that when you drop a creature they will be stunned and vulnerable for a short period. Because of this, you have to be mindful how close to the enemy you release your minions. You could use the Call to Arms spell – a war banner which all your creatures will rush towards. But my personal favorite would have to be the ability to posess one of your creatures. Once posessed you can control your creature and wander around your dungeon. On top of that, you can use the ‘Group’ mode to select creatures which you want to join you on a raid. Simply select group mode, spot a creature you wish to have join your party and click. Once you’ve got a decent team it’s a matter of walking over to the enemy dungeon and wiping the goodly smiles from their faces. All in all, Dungeon Keeper 2 is a riot of a game. It is beautiful, it sounds fantastic, the gameplay is straightforward and enjoyable, and most of all it is wickedly funny.